South Seattle – Artist Carina A. del Rosario will premiere her temporary “passport office” on Saturday, Sept. 6, 2014 at the Rainier Beach Art Walk, on South Henderson between Rainier Avenue South and Seward Park South. Del Rosario explains that she created her Passport Series to provide people with a different experience. She re-framed typical application questions and participants use their own words to describe the most important parts of themselves. She takes their answers and their portraits and assembles them into individual booklets that resemble travel passports. At the Rainier Beach Art Walk, people can view over 20 completed booklets, and participate in the project by having their portrait taken and completing one of del Rosario’s application forms. These will be added to the growing series, some of which will be featured at an upcoming exhibition at the Wing Luke Asian Museum. While del Rosario has been working on the series with individual friends since 2013, this is the first time she will be doing it as a participatory public installation. Del Rosario’s “Passport Office,” at booth number 13, will be open from 10 am to 6 pm, Saturday, Sept. 6, 2014 during the Rainier Beach Art Walk. Spanish, Vietnamese and Somali interpreters will be available to assist people from those communities who want to participate in the project. Funding for the Passport Series is provided, in part, by the City of Seattle’s Office of Arts and Culture. For one unforgettable day wide open frontiers, mammoth steeds that galloped directly out of a Sergio Leone Spaghetti Western, and stagecoaches loaded to the brim with cowhands who made liberal usage of the expression “Yee Haw,” delighted the children of R.A.Y’s West Hill Family Center’s Youth Counseling and Therapy Program as they made the Wild West their playpen. 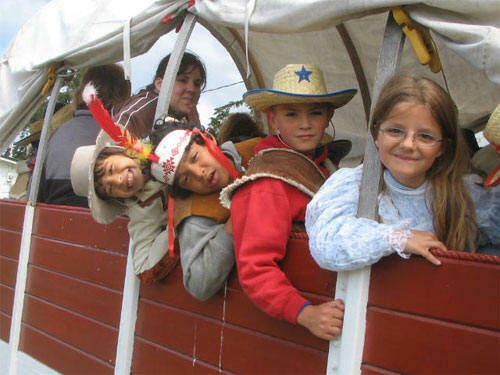 Last Wednesday over 60 mostly elementary aged youth and their families joined with the counselors and therapist of the Center – located in the Skyway/ West Hill neighborhood- in venturing to Whidbey Island to experience Cowboy Camp at the M-Bar-C Ranch. This opportunity appeared to be welcome by the Center’s children as all are currently undergoing some form of counseling for reasons that include physical abuse, parental neglect, and anxiety issues, as it acted as a much needed respite from the heaviness of many of their personal situations. The trip was made possible by a generous local benefactor who paid all expenses associated with the children, their families, and the Center’s staff attending the day long camp. A gift that amounted to several thousand dollars and was made primarily because the donor wanted the kids to share in the unique experience he felt the ranch afforded. Though the trip to Whidbey provided an opportunity for the youth to venture out from their familiar urban surroundings, possibly the biggest, and most enduring, benefit of the day was that it provided a much needed bonding experience for them as they often times face feelings of alienation and ostracism that come from participating in therapy at such a young age. “The coolest thing about this event was that during the year we mainly work with kids one-on-one, so much of the time they never meet each other, or even see each other, unless they’re passing by in the waiting rooms. Otherwise, they don’t get to build relationships.” Wells said. 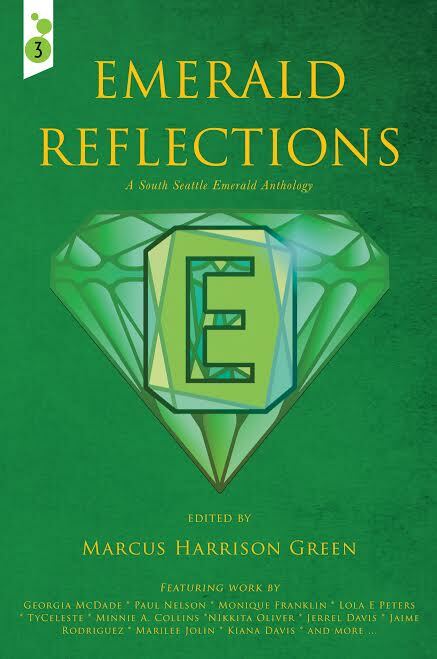 Editor’s Note: History and Heritage is a new column focusing on South Seattle’s storied past. 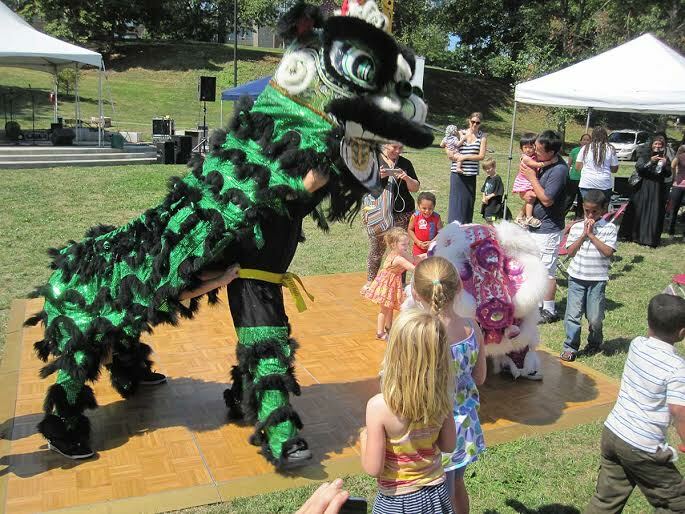 Lion Dancers enthrall festival goers. Purchased and constructed in 1977 by the Seattle Parks Department, Othello Park has not been around nearly as long as some of the other parks in Rainier Valley. But in one of our oral histories, we recorded a reminiscence from Karleen Pederson-Wolfe, from her ’50s childhood living next to the area that later became the park. The following was excerpted from an interview conducted on November 14, 2001. These days Othello Park doesn’t have any neighbors sending their cows over to graze, but last Sunday, August 17th, 2014, at the Othello Park International Music & Arts Festival, there was a camel, a pair of baby goats, and a few other animals on hand to encourage kids to come out for the event. A varied array of people from the surrounding areas flooded the park, where they were able to visit the booths selling merchandise and presenting information from local organizations, including Rainier Valley Historical Society. At our booth, we had a display of ’70s photographs by local photo-journalist Denis Law, which included photos from Jimi Hendrix’ funeral procession. Visitors to our booth were very interested in seeing the photos, and reading the corresponding articles on our display board which were reproduced from our archives of issues of the Beacon Hill News and South District Journal. The event provided us with an opportunity to talk to people about their experiences living in Rainier Valley and their memories of the park itself. People talked about how much it been improved over the past few years, with the overgrown hills of blackberries being replaced by comfortable grassy hillsides. We also had the good fortune to be able to see demonstrations of local heritage and culture, from the lion dance put on by Vietnamese group Au-Lac Vovinam Lion Dancers, to a group of Oaxacan dancers in white dresses balancing candles on their heads, a demonstration of South Indian Bhangra, to a group of Somali dancers, and even a group of very talented young tap dancers. The Othello Park Alliance puts on the festival, as part of the annual Rainier Valley Culture Fest weekend, which also includes the Heritage Parade down Rainier Avenue, which we participated in the previous day. Rainier Valley Historical Society is dedicated to preserving and sharing the history of our area, and we are also tasked with recording the activities and displays of culture in our current communities, as a way to show future generations what the Valley was like before their own time. Co-Founder John Helmiere speaking to Collaboratory members. The Collaboratory (http://hillmancitycollaboratory.org/ ), quietly blooming on the corner of Rainier Ave S. and S. Orcas Street, is, even in its infancy, an enormous idea. 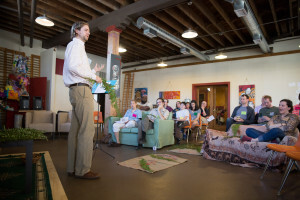 South Seattle is indeed fertile ground for the seeds of change being sown by founders John Helmiere and Ben Hunter. Open for only 6 months and already achieving its intended goals of building community and equipping change makers, the Collaboratory was originally envisioned as an “Incubator for Social Change”. Composed of co-work office spaces, the Mixing Chamber (a large, open, multi-purpose area), a learning kitchen, backyard community garden and drop-in center the Collaboratory is serving the community’s needs in a variety of ways. Perhaps the rarest aspect of the endeavor lies in its self-defining nature. Non-profit organizations, start-ups and individuals join the Collaboratory as co-work partners, utilizing the essential office resources of a mailing address, conference room & office equipment. Additionally this space serves as a gallery for artists to display their available work. The Learning Kitchen, currently under construction, will offer cooking classes and other educational resources devoted to feeding a diverse community, focusing on healthy, local food fit for many palates. The backyard garden, which is open to all, hosts a community BBQ every Sunday. The Mixing Chamber area, available both for one time or ongoing events, hosts a monthly featured artist’s exhibit as well as a variety of social justice organizations, neighborhood groups and community gatherings. Continuing use of the space or close proximity to the Collaboratory earns partners a special rate for use of this resource. Drop-in hours in the Mixing Chamber are from 10-2 on weekdays. This is a time when all are welcome and invited to have a hot meal (offered daily), peruse the free library, or obtain toiletries and household goods as needed. This is also an ideal time to meet with Collaboratory staff, discuss opportunities and get a feel for the environment of community connection. Overall, the Collaboratory is the very embodiment of partnership. It is an environment built of our community’s experiences, goals and best intentions. One hopes that it continues to flourish, blossoming in the rich soil our area provides. Two South Seattle area non-profits have received “People Helping People Awards” from Boeing Employee’s Credit Union (BECU). City Fruit’s Terri Iverson receives their People Helping People Award. Both City Fruit – which is located in the Beacon Hill neighborhood and harvests fruit from residential trees to donate to those who are food insecure – and the Rainier Beach Community Empowerment Coalition (RBCEC) received $5000 apiece as a part of BECU’s Community Benefit Award program. The program asked BECU members to vote for their favorite area non-profits that they felt had made a profound impact within their communities. City Fruit and the RBCEC received enough nominations to beat out over 500 other Puget Sound area non-profits to be recognized as 2 of only 16 total organizations that were honored for that distinction. Votes were tallied over a three month period beginning on May 1st and recipients were honored with a ceremony at the Museum of Flight. 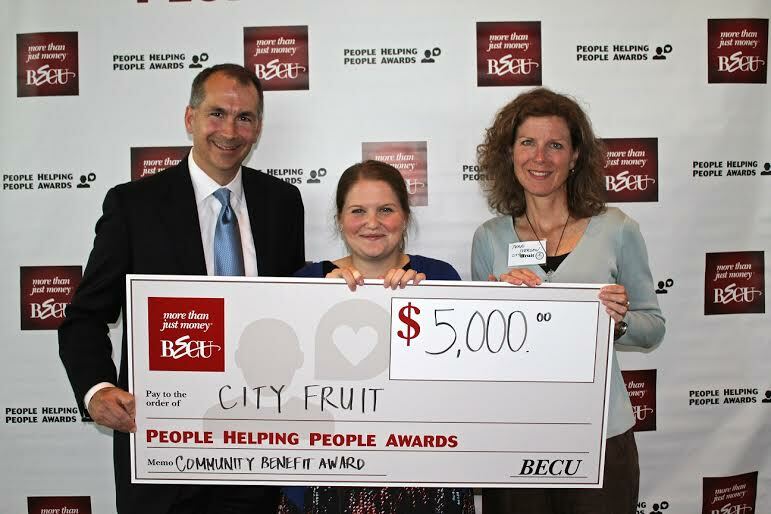 “The People Helping People award from BECU will help City Fruit harvest additional fruit from residential properties and Seattle parks, and in turn, help feed more of our neighbors in need. On an average day, City Fruit harvests around 500 pounds of fruit – pears, plums, and apples – that will go on to feed more than 2,000 families throughout Seattle.” said Catherine Morrison, City Fruit’s Executive Director. South Seattle’s streets will be sizzling this weekend, but it has absolutely nothing to do with the blistering summer temperatures as this Saturday kicks off the joint celebration of the 6th Annual Seattle Summer Streets Party and 22nd annual Rainier Valley Heritage Parade. Rainier Avenue South will be closed starting at 10:00am tomorrow as festivities commence at noon on the avenue -from S Alaska to S Brandon St- with a parade that features as wide an array of entrants as you would expect to be unearthed from South Seattle’s overflowing chalice of diversity – which include dancers, marching bands, elaborately costumed entertainers, and one of a kind floats that must be seen to be believed. Featuring a beer garden, contestants vying for the crown of Rainier Valley’s Best BBQ, young and old alike disregarding all practical dieting advice so they can stuff their stomachs with whole pies in the span of a few minutes, and a DJ booth spinning tunes throughout the day to keep everyone energized, the event is expected to attract over 5000 parade goers this year, including Seattle Mayor Ed Murray. With all eyes in the 206 area code (that aren’t blood shoot from a center other festival going on this weekend) gazing on the south end this weekend, we provide you with a guide to the celebrations various activities. Re-Imagining Your Streets Activities: With the obvious attention that has been given to public safety concerns in recent weeks, there will be several events that attendees can participate in throughout the Street Party that will provide an opportunity for south end residents to envision what they would ideally love to see the community become one day soon. Bicycling & B!kecitement Street: Rainier Avenue will get a temporary makeover as pop-up bike lanes will be stretched along the avenue allowing bicycle enthusiasts a period of nirvana as they get to glimpse what a cycle friendly road just might some day look like. BBQ Contest: Everyone who has ever muttered that Texas has the best barbecue has done so only because they have never once ventured into South Seattle. With barbeque in this area ranking somewhere between coffee and religion, amateurs will compete against each other in a no-holds, bare knuckled, sauce-bath contest for the taste buds of south end residents. When this is over, only one hickory splattered contestant will be able to lay claim to having the best BBQ in the Rainier Valley. Art in the Alley: Absolutely no event is complete without some sense of refinement, and this one is no exception as the Columbia City Gallery exposes works of local area artisans to the masses in the alley ways of Rainier Avenue. Event goers will be treated to original artistic productions and will be able to return home feeling like a member of high society. Warning: The Gallery takes no responsibility for those who begin wearing a monocle after the event is over. Pie Eating Contest: Diets were made to be broken, and what better place to lose count of calories than at a pie eating contest. Open to anyone who attends, this contest dares you not to woof down as much insulin spiking, crusted cake as possible during a given time span. Only those free of cavities and who happen to have a stomach that won’t quit need apply! 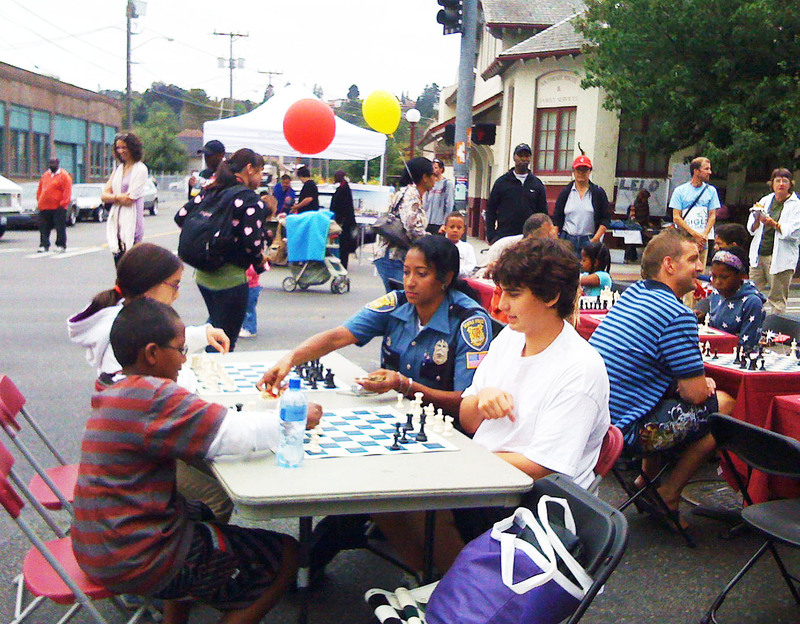 Chess Tables: As we’re apparently still searching for Bobby Fisher, there will be plenty of chess tables placed throughout Rainier Avenue, so that anyone looking to become the next grand master can try their hand at high stakes chess. No one leaves the table until the King falls! Location: Between Ferdinand and Hudson. Note: There will be instructors stationed at each table to teach newbies how to play. After Party Festivities: Because the party isn’t over, until it’s over!!! Blues Fest: Actually kicking off a day before the party officially gets underway, the Columbia City Blues Festival welcomes an assortment of local and national talent who will be channeling the likes of Jimi Hendrix, Hank Williams and Jimmie Rogers. A delight for area audiophiles. Runs Friday, Saturday, and Sunday night at The Royal Room. Cinema Under the Stars: The day finishes up with a movie that has countless stars attached to it (not the botox infused ones, but the actual balls of flaming gas kind). Columbia Park will undergo a metamorphosis into an open air movie theater for one night as it presents a viewing of the Fantastic Mr. Fox. The movie will begin at 7:00pm. 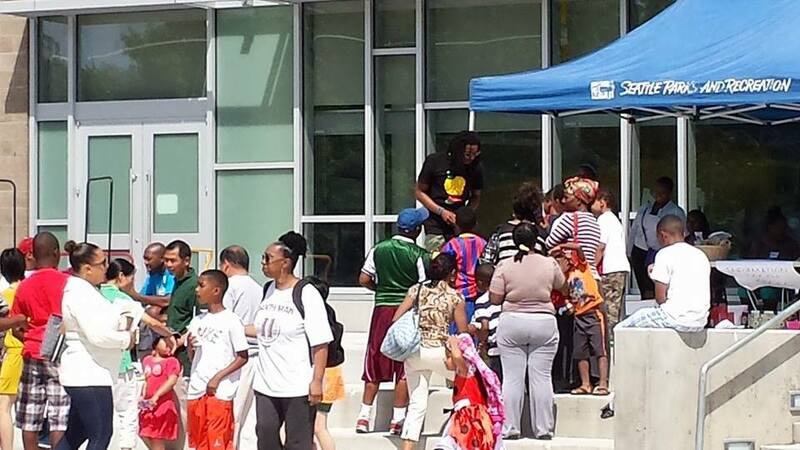 Proving to be every bit the party that its title intimated, the Rainier Beach Back 2 School Bash – put on by Rainier Beach Community Empowerment Coalition– commandeered the plaza of the Rainier Beach Community Center this past Saturday. Replete with a DJ Booth (DJ Uncle Guy) that blasted out a diverse mixture of hits that inspired an impromptu group dance to Pharrell Williams’ song Happy, sequined frolicking lion-dragons of Vovinam that enthralled the hundreds of children and adults in attendance with a lively performance that spilled out all over the plaza, and dozens of pop up tents with animated host- which included Seattle Parks and Recreation, Seattle City Light, Bikeworks and Got Green amongst others – it appeared that the Champs-Elysees had been transported to the corner of Rainier and Henderson for a few hours. However, the Bash – in its eleventh year- wasn’t all fun and games. As it also functioned as a school supply giveaway for area youth, who were required to visit several resource tables stationed at the event – which provided everything from information on public safety to higher education- in order to receive a back to school package which included notebooks, backpacks, calculators, and other necessary, and increasingly costly, school items. “This was so fun and exciting! I was so glad for all the opportunities to speak to people at the (resource) tables, and get a ton of information that you don’t normally get.” Said Chris Smith, a young attendee who brought along his mother and younger sister and left with a new backpack and a stack of free books courtesy of the Bash. Usually held in Beer Sheva Park, the event was forced to relocate to the plaza due to the construction currently taking place at the park. The new locale actually appeared to boost community attendance as close to a record number packed the square just outside the community center, including many who found out about the Bash through happenstance. “I was just driving, on my way home, and I saw all this activity at the plaza. I didn’t know what exactly was going on but it looked public. So, I made a U-turn and picked up two of my grandchildren from their place and said: Let’s go check this out!” Commented Patricia Newman, a 19 year resident of the Rainier Beach area who was attending for the first time. With the huge crowds displaying the rich cultural diversity that the southend of Seattle has become identified with, Gregory Davis -who heads up the coalition- was ecstatic that the turnout flew in the face of what he feels is an unfair perception that brands the community as fragmented. “I’m overjoyed at the number of people here! This is our eleventh year, so we knew that we’d get interest from the community and that’s what we’re trying to do – to be a community building environment. 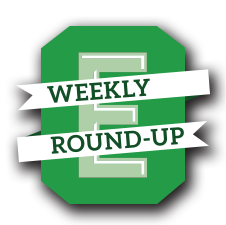 We’re excited about it, as a community we want to be able to support people with resources and information as they go back to school.” Davis said. As hundreds flocked to the event right up until its waning hours, community solidarity seemed a theme latched onto by most attendees. “Rainier Beach really gets a bad rap. Yes, there are a few people who engage in activities that give everyone else a bad name, but everyone here, and there are a lot of us, are here to show support for this community we live in and that we aren’t going anywhere.” Said September Jewel an event volunteer. In an area that has seemingly made headlines for all the wrong reasons in recent months, event participants hoped that besides school supplies and community socializing, the Bash would also provide a glaring counterpoint to the negative portrayal that the Rainier Beach area has received in much of the media .